my bare cupboard: Orange and ginger caramelized chicken wings "
Lemongrass is an essential herb in Vietnamese and Thai cooking . It's so versatile and has a great health benefits . As a culinary herb , its citrus-like flavor is a great addition to some Asian dishes . In this dish , it adds a subtle fresh flavor that goes really well with orange and ginger . This is a Gordon Ramsay recipe , love him or hate him , he sure can cook and create fantastic Asian recipes ! I borrowed his book from the library and of course , I gravitate toward his chicken recipes . 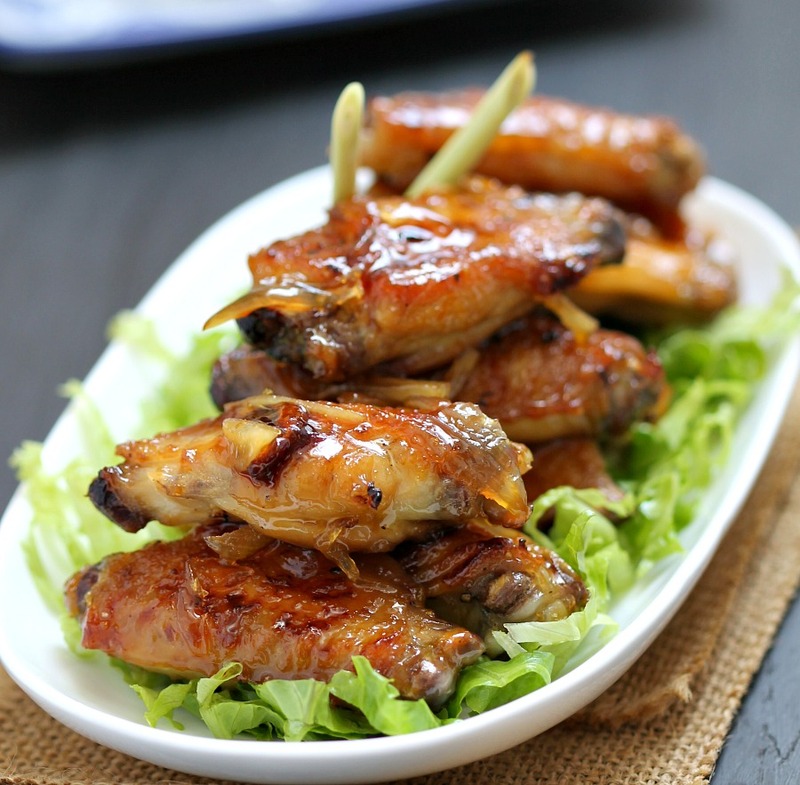 Chicken wings are cheap , just needs minimal cooking time and with right amount of seasonings , it'll certainly taste wonderful ! The flavor in this wings is a balance of sweet and spicy ( not hot ) , the caramelized sauce alone is worth making and can be use with fish , pork and beef . * Preheat oven to 180°C . * In a mixing bowl , combine the chicken , salt and black pepper , mix together , set aside . * Heat oil in the pan , add shallots , garlic , lemongrass , ginger and orange zest , cook for 2-3 minutes , or until all ingredients have softened , Add the sugar , water , orange juice and fish sauce and stir to dissolve . Cook over medium-high heat or until the mixture has reduced and thickened . This should take about 3-4 minutes and the sauce should start turning syrupy . Remove from heat and transfer into a heat-proof bowl , set aside . * Wash the pan and heat it , add in oil when oil is hot , add chicken in batches , cook until both sides turn browned , about 3 minutes . Transfer chicken to an ovenproof dish and pour over the caramel sauce , mixing well to coat . Cook in the oven for 40-45 minutes I cooked mine for 30 minutes , turning the oven temperature to 220 °C after 25 minutes of cooking until golden brown and sticky , halfway through cooking , baste the chicken wings . * Remove chicken from the oven , let cool a bit and serve on its own , with beer or with steamed rice . This post is linked to the bloghop event Cook like a Star , organized by Zoe of Bake for Happy Kids , Yen of Eat your Heart Out and Mich of Piece of Cake . The Chef for the month of August is Gordon Ramsay . Your chicken wings look finger licking good! o my...these look fingerlickingly delicious, Anne. The photos are as amazing as the recipe. These look wonderful and moist. I'll have to save this recipe. It would be perfect around SuperBowl time. Ciao carissima..che bel piatto..queste alette sai che sono le miei preferite? Caramellate devono essere squisite. Visto che sono le uniche a buon prezzo si possono fare quante volte si vuole. I am going to cook this. This looks super delicious! I have seen this recipe and have bookmarked to make, along with tons of other recipes! Regarding your question on the mascarpone cheese, yes, I used Anchor brand. Give it a try, very easy peasy, and so economical making your own Mascarpone Cheese! It costs a bomb for a small tub over here! I'm admiring the glossy glaze of these chicken wings... The reflection of the lights on them is telling me that they are stickily GOOD!!! Oh! they look insane.... now I'm the most hungry person in the whole world.. Yes, we need to eat savory food too, but these chicken wings are sweet too! looks so good! Of course not, cookies are for snack and you do need something yummy for lunch, like this ginger caramelized chicken. Seriously Anne, I am salivating. 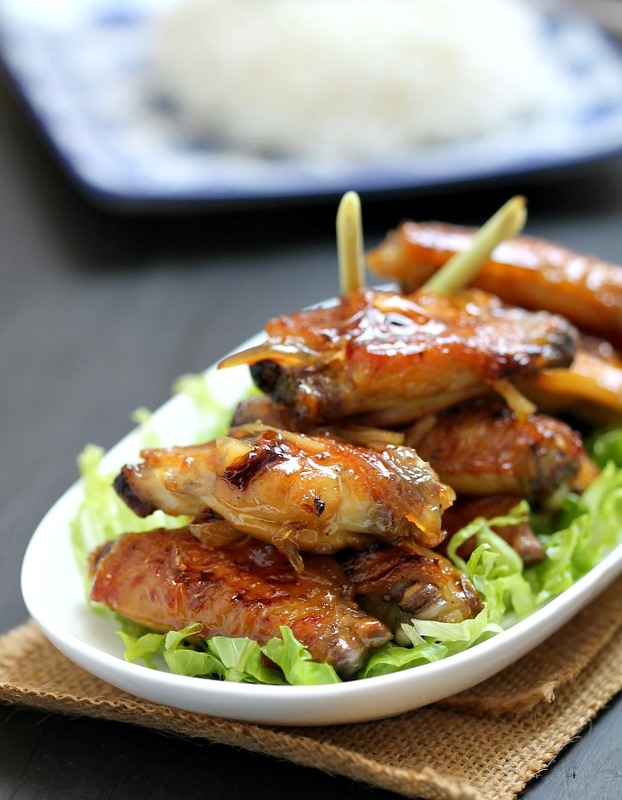 tangy, sweet and savoury chicken wings, who can resist! OMG Anne, your chicken wings look so glistening.... makes me wanna grab one and eat it right now! I love GR a lot too, his recipes are always great though some of his ingredients (for his Western recipes) are not very easy to find in KL. these look seriously good and making my mouth water right now! grrr...!